Hyperion Towers is a popular oceanfront complex located in the Cherry Grove Section of North Myrtle Beach. Every unit within Hyperion Towers is oceanfront, so no matter where you're located you will have awesome views of the ever beautiful blue Atlantic. 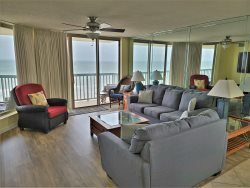 Soak up some North Myrtle Beach sunshine on the spacious oceanfront deck or take a refreshing dip in the swimming pool. Every unit has a full service, spacious kitchen that will ease your meal preparation. The use of the individual washer and dryer in each unit will also make the laundry duties a breeze. Hyperion Towers is located close to restaurants, shopping, and our very own Ocean Drive Pavilion and Amusement Park. Call today to reserve your Hyperion Towers vacation condominium.